1. 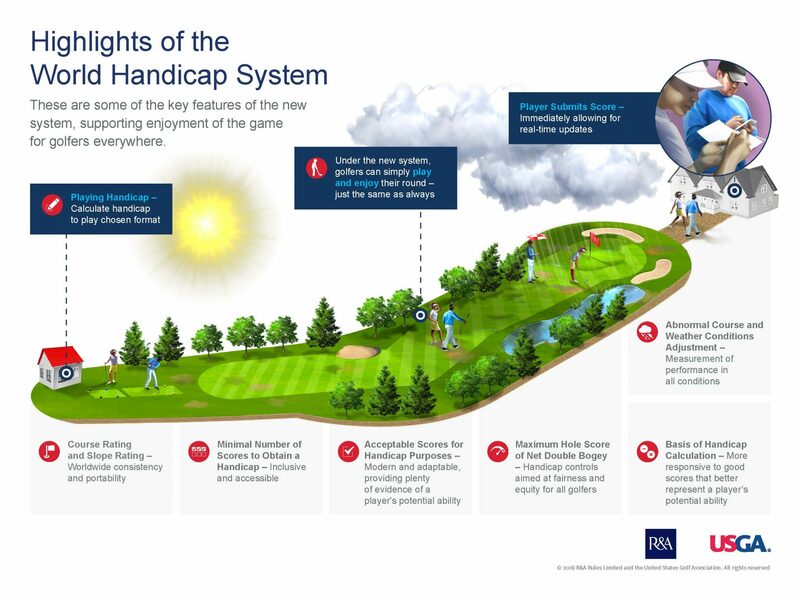 What is the World Handicap System (WHS) all about? and meet the varied needs and expectations of golfers, golf clubs and golf authorities all around the world and be adaptable to suit all golfing cultures. 2. What are the benefits of the World Handicap System? 3. How will existing handicaps be used for the World Handicap System? Also, is my handicap expected to change when the system goes live? 4. Will the World Handicap System impact the way the game is played in my country or region? 5. Does the World Handicap System have the support of all the existing handicapping authorities and other National Associations around the world? Each of the six existing handicapping authorities have recently gone through their own internal approval processes, and all of them have confirmed their support for the new system. While the USGA and The R&A will oversee the WHS, the day-to-day administration of handicapping will continue to be the responsibility of the existing handicapping authorities and individual National Associations. 6. Have you consulted with golfers and golf club administrators about the World Handicap System? 7. What is the timeline for implementation of the World Handicap System? 8. What other details of the World Handicap System can you share? Further details of the WHS will emerge over the coming months. However, we want to emphasize that it is being designed to be as accessible and inclusive as possible, while still providing golfers with the portability, accuracy and consistency they expect. Offering a couple of examples, golfers will be able to obtain a handicap after returning a minimal number of scores – the recommendation being as few as three 18-hole scores, six 9-hole scores or a combination of both to comprise 54 holes. Handicaps will not lapse after a period of inactivity and the maximum handicap will be 54.0, regardless of gender. These elements are designed to clear a pathway into the game, enabling players new to the sport to feel more welcomed into the golf community. 9. How and when will golfers and golf club administrators be educated on the World Handicap System? 10. Will the introduction of the World Handicap System have an impact on the current technology infrastructure? 11. Is there a place I can go for more information about the World Handicap System? You can visit www.usga.org, www.randa.org., or your National Association’s website.